The Doctor’s new duds and the art of the con. January 31, 2014 By Tim Johnstone | Heads up: Buying via our links may result in us getting a commission. Here's why. THE NEW DOCTOR GETS HIS DUDS. I don’t know about you, but I’m liking the look. It offers up respect for those who came before. 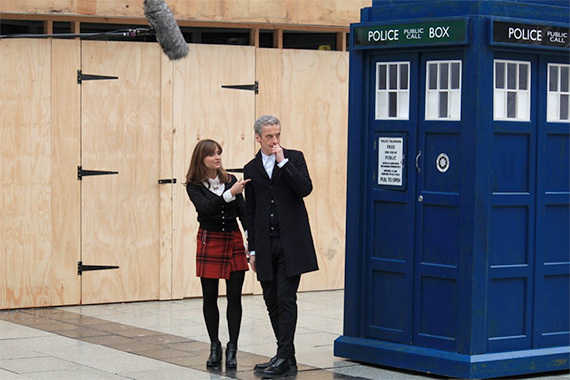 From the BBC press release: Sporting a dark blue Crombie coat with red lining, dark blue trousers, a white shirt as well as black Dr. Marten shoes, the look was created by Doctor Who costume designer Howard Burden. FOOD FOR THOUGHT: This is something: what a death row inmate’s last meal has to say about their perceived guilt or innocence. RED HOT CON OF THE WEEK: This is a work of art. CONSEQUENCES: Expect SUPER SHAVE SEPTEMBER to launch this fall. NOT. EVEN. SURPRISED. Except, maybe, that it took this long to happen. N IS FOR NARWHAL: These are amazing. It almost makes me want to reproduce. I SAID ALMOST. Also, totally exaggerating. WHEN IT COMES TO IMBIBING…we’re mostly amateurs. Also, stereotypes are often based on facts (looking your way Russia). CONSEQUENCES PART D’OH: Who didn’t see this coming? Anyone? Alanis? Although Miss Piggy handled that with remarkable aplomb. CONSEQUENCES – THE TRIFECTA: If Denver wins the big game this weekend, this is going to happen. UDDER PYROTECHNICS: And boom goes the barn. BELIEB THIS: The White House certainly wants to avoid having anything to do with this. But they might not have a choice. ZZZZZZZZ’s: Apparently placebos don’t just come in pill form anymore. I have doubts about how long this would actually work before it all went horribly wrong. FIRING ON ALL SYLLABLES: Or at least one syllabus. This is going to make certain talking heads go bonkers. LET IT SNOW, LET IT SNOW, LET IT SNOW: You might say it’s the Sochi mantra right now. I love Terry Gilliam’s movies. This one. This one. And especially this one most of all. I can’t wait for this. Love shoes but not sure about what to call what what? This is for you. Come for the helpful advice. Stay for the amaze ball comments. If you only bookmark one page on the interwebs today, this is the one! Who still puts out non HD trailers! Apparently those aren’t Doc Martens (fooled me too) they’re by Loake ( http://www.loake.co.uk/ ) … but MAN do they look just like a pair of Docs. Did anyone else watch that entire preview (which looks amazing, as one would expect from Gilliam) thinking the main character is John Malkovich…? The placebo effect is absolutely fascinating- even in real medicine it can account for half a drug’s efficacy. That means that for some medication, HALF of the work is done by your perception of the drug and someone who believes in the drug gets double the effect that a skeptic would. I apply the same principle to movies, restaurants and stand up comedy – if I convince myself it’s going to be good I enjoy myself a lot more. i know little about Dr. Who. The Doctor and Dappered on the same page? Two of my favorite universes have collided. Nice way to start the weekend. The coats in that show are always amazing. I really want Matt Smith’s tweed jacket from his first costume. Can’t wait for the new season of Dr. Who! Really interested to see where Peter Capaldi takes it.